Behati Prinsloo is an easily recognizable face and a force to be reckoned with in the fashion industry. Yet another proof that schooling doesn’t always correlate with success, the supermodel began pursuing her dreams as a teenager and gradually worked her way to the top, after landing jobs with a plethora of big fashion brands. In addition to her professional accomplishments, Behati is also the other half of a celebrity couple that is known for supporting each other’s soaring careers. Here are amazing facts you never knew about hunky rock singer Adam Levine‘s wife and a woman who has achieved enviable feats both professionally and on the home front. Originally from Namibia, Behati Prinsloo is an only child born on May 16, 1989, to parents Magda and Boet Prinsloo. She was raised in her hometown of Grootfontein, Namibia. Behati had a decent upbringing from her dad, a Christian minister and her mom, a businesswoman who ran a bed-and-breakfast. Her academic records show she attended Grootfontein Secondary School before pursuing her modeling career in full. Behati Prinsloo had a life-changing experience at age 16 while holidaying with her grandparents in Cape Town, South Africa. It was during this time while shopping at a grocery store that she was spotted by a model scout Sarah Doukas. Prinsloo relocated to London that same year in pursuit of her modeling career. She debuted on the runway in big fashion shows in Milan and Paris. The model followed up with jobs for top brands such as Vogue, Alexander McQueen, Fendi, Chanel, and Henry Holland. Behati got a major breakthrough in 2007 when she began modeling for top lingerie brand Victoria’s Secret. Two years later she was endorsed as a Victoria’s Secret Angel and became the face of the brand Pink. The supermodel has worked with other top brands such as Marc Jacobs, Tommy Hilfiger, Pepe Jeans, Louis Vuitton, MaxMara, Chanel, Lacoste, Narcisco Rodriguez, Hugo Boss, Juicy Couture, Zac Posen, DKNY, and Paolo Roversi, among others. She has also made it to the cover of many top fashion editorials including Glamour Magazine, French, Swedish & Italian Elle, Interview Magazine, Spanish Vogue, Mexican GQ, Italian Muse and many more. More so, Prinsloo featured in the 2009 music video Rich Girls by The Virgins. In 2012, she appeared as a guest star in an episode of CBS network’s Hawaii Five-O. Behati Prinsloo is happily married to American rock star Adam Levine. The supermodel and lead singer for the pop band Maroon 5 met in 2012 through a mutual friend when Adam was in search of a model for his music videos. 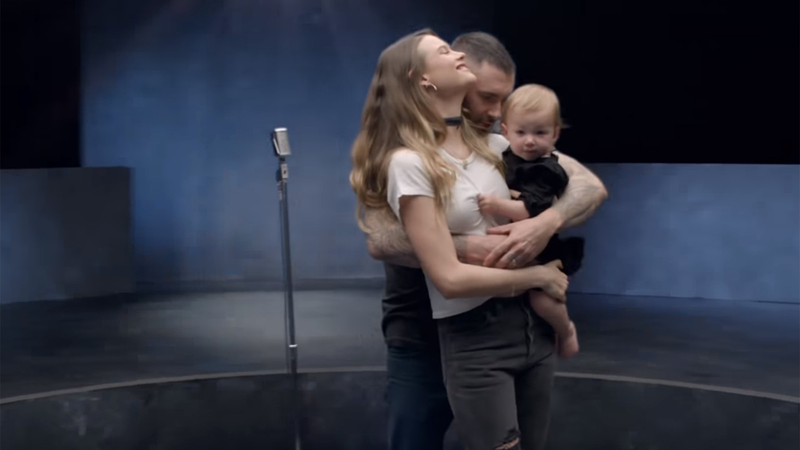 Though Prinsloo didn’t eventually appear in Levine’s video, they quickly established a romantic bond and were engaged a year later. Behati and her husband Adam officially exchanged nuptial vows in Cabo San Lucas, Mexico, on July 19, 2014. Their union has so far produced two daughters – the first Dusty Rose was born in September 2016 and the second Gio Grace was born in February 2018. Despite their demanding schedules, the couple puts their family first and have been waxing strong together over the years. During her two pregnancies, Behati took breaks from modeling and only returned after her maternal duties. More so, Behati and Adam who are often seen together on the singer’s tours, adore each other and do not hesitate to flaunt their love life with fans on social media. Like most other celebrities, Behati’s relationships have always made headlines. Prior to Adam Levine, the model was in a longterm relationship with her British colleague Jamie Strachan. The former lovebirds began dating in 2005 but went their separate ways in 2012. Behati Prinsloo has worked with top brands and has also carved a niche for herself in the fashion industry. Prinsloo’s exact salary figure nor earnings are unknown. But if her career profile is anything to go by, then it is safe to say she has amassed a sizeable fortune for herself. The supermodel’s personal net worth is currently estimated at $3 million. 1. Behati is a supermodel endowed with alluring looks. The hazel-eyed Victoria’s Secret model stands at a height of 5 feet 10 inches (1.78 m) complemented with a weight of about 53 kg. Her body measurements are bust – 34 inches, waist – 24 inches and hips – 35 inches. Despite having two kids, Prinsloo has done a good job at maintaining her slim build over the years. 2. Besides her hunky husband who was once named the Sexiest Man Alive by People’s magazine, Behati is also considered one of the hottest in the industry as she was once ranked 12th on the Top Sexiest Models list by models.com. 3. The supermodel is originally from Namibia and her unique Afrikaans name Behati translates to Beatrice in the English language. 4. Behati Prinsloo loves working with the camera both in front and behind the scenes. Given her love for photography, it is safe to say that she is passionate about her job as a model. 5. Behati is an animal lover who keeps a cute hairless Sphynx cat Gollum as a pet. 6. Among her many celebrity friends and acquaintances, Behati’s close pals are her colleagues Candice Swanepoel and Coco Rocha.